I Don’t Understand Why I’m Not Getting Results? I’m Seriously Working Out! There is nothing worse than working out hard but not seeing the results you’re expecting. It’s influenced a lot of us to throw our arms up in the air and wonder just why we even bother to train so hard. As a coach and strategist to my clients, I am only with them for a few hours a week. I have some idea what’s going on the other 150 hours a week but at times it’s just not enough. So, I wanted know more and I began monitoring my daily activity using the Body Media device that is used on The Biggest Loser. I am not a big fan of the show because of the drama and sensationalism TV displays, but I am interested in all the technology that can provide serious results to my clients. In all, the Body Media device tracks: daily calories burned, daily calories consumed, daily calorie balance between calories burned and calories consumed, daily activity (measured in METs), daily steps taken, daily sleep duration, and weight recordings when you enter your data. 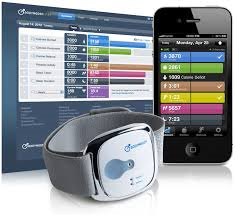 The Body Media device acknowledges your new personal bests every time you set one. In 6 weeks I have set 25 personal bests ranging from 4 hours 14 minutes of total physical activity, 8 hours 30 minutes of lying down (I wish I could say deep sleep), 21,504 steps in a day, and 3273 calories burned in one day. Have I found it helpful as a tool to encourage movement, results in weight loss, and overall motivation? Definitely Yes! Tracking your movement, food intake, and sleep will keep you honest and working towards your goals. Most of us have no idea how little we move especially with the jobs we are working nowadays. We just aren’t asked to do all that much! To those of you that are specifically looking for weight loss (large percentage of the population-no pun intended) I recommend the Body Media device as a tool to help you get much better results. You can monitor your results closely just by becoming more accountable to yourself. You will only have to sync the arm band device with your computer or phone every 3-5 days or so. If you know that your nutrition is already a weak link I highly suggest you enter your food and track your intake so that you can make improvements in your eating and diet. So many people suffer in this area primarily because you have not been effectively coached and educated when it comes to nutrition. If you need help in this area I highly recommend you check out: Nutritional Coaching here. Once you learn effective strategies and practices you can apply your improvements for the rest of your life. How active are you really? Have you measured or assessed yourself lately? It’s not just all about the workout if you’re wanting to get fit and lean. You definitely have to control and master your metabolism but you need to know just how active and nutritionally challenged you may be. Unless you begin to measure and assess your daily habits you will always wonder why you’re not getting the results you’re after even after working out intensely. Implement a program that is comprehensive and NOT a cookie-cutter program. You have unique needs and challenges I’m sure; we all do. To learn more about how the Body Media device can benefit you I highly suggest sitting down with me in a: Free Fitness Coaching session. If you want lifelong results and you’re ready to apply yourself I would like to help you.